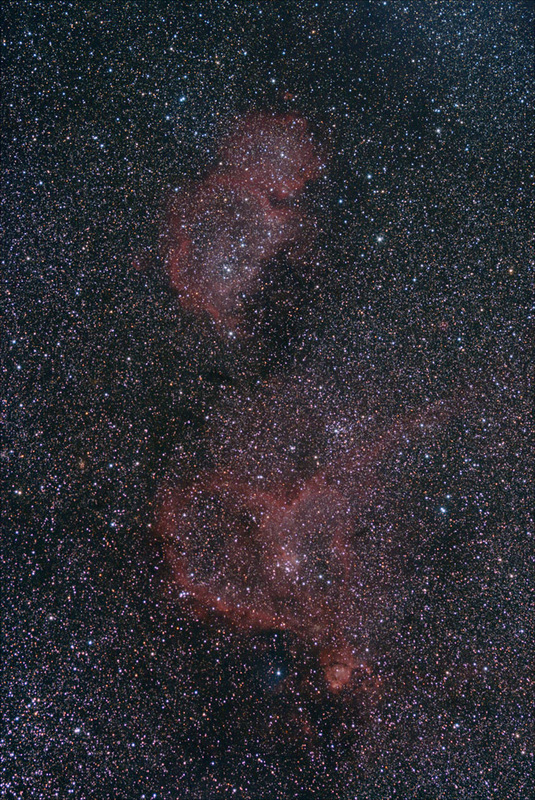 Popularly called the Heart and Soul Nebulae, this large nebulous area is located in a swath of the milk way running between the constellations Cassiopeia and Perseus. The actual designation of these red emission nebula are Sharpless2-190 and Sharpless2-199 but they are also referred to by several other catalog designations. Click image for larger version (1280 x 1914, 1.5mb). Exposure Stack of 31, 5 minute exposures at ISO800. Notes 59°F, 80%rh, average transparancy. RAW conversion, registration and stacking in DeepSkyStacker. Additional adjustments in PixInsight LE and Photoshop CS2.